I wanted to follow-up on my Chicago piece with another look at professional services. A question was raised as to the conflict between saying Chicago is a professional services hub, and that its global city rankings are too high when those rankings are based on professional services. A fair point. I think it depends on the nature of what type of professional services we are talking about. Saskia Sassen reminded me that global cities compete much less than is currently believed because they specialize in different things. So I wonder if perhaps specialization is one axis upon which we could measure professional services. Another might be how tightly these services are tied to the particular needs of the global economy. That is, globalization created the need for new financial and producer services to help control and manage the resulting networks. So my question would be, is any particular service one whose demand was created by globalization, or some previously existing type of demand? Global City Function. These are what I think of when I think of globalization services. That is, they exist to serve the particular needs of our globalized economy, and they have some degree of specialization that makes them difficult to obtain just anywhere. Perhaps they depend on particular skills and expertise only available in particular places. One might think of something like services related to international steel trading here. Niche/Cluster. These are also specialized functions, but aren’t particularly related to globalization as such. I might use as an example the design of super-tall skyscrapers. This may be global in that they are all over the world, but this isn’t a service that was per se created by the needs of a global marketplace. These services were needed to design the Sears Tower, for example. Network Access. I’ll pick a geeky term for this. These functions are related to global markets, but less specialized. I can’t think of any slam dunk examples, but perhaps something like general international contract law might be one of them. I think of these as access points to the global economy or points of presence by various services firms. In a sense, these get you connected to some of the global economic circuits. They let you do basic things without going elsewhere. They might be driven by how important your city is as a place global services firms feel they have to plant their flag, for example. Routine. This I believe is the bulk of professional services. It is basic strategy, IT, outsourcing, accounting, etc. that would be done for various businesses regardless of globalization. Indeed, these have been done for decades. Installing corporate IT systems for instance. Or evaluating a corporate cost reduction program such as what McKinsey did for Conde Nast last year. These might require some domain knowledge, but it’s not like you can only get them in a single place. Hence I raise the question as to whether some of these are vulnerable become commoditized. As you can see, this has some similarity to my previous Diversity-Tradeability Matrix, where the top half of the chart is non-tradeable services. That doesn’t mean services they can’t be provided to an export market, but rather they are ones for which there are few alternatives sources of supply or substitutes, which makes them difficult to offshore. My belief re:Chicago is that while it probably plays in every quadrant, its bread and butter was routine services. This is why I believe the global city surveys overstated Chicago’s standing. They rely on counts of branch offices and such without sufficiently differentiating the types of services being provided. The word routine doesn’t sound glamorous. But I actually like the space because of its potential for more broad based employment generation vs. hyper-specialization. And these are in fact high value services. Plus, it is where I spent most of my career, so obviously I can’t hate it too much! The challenge is that this is the sector that is getting battered the most by offshoring and new entrants, as well as macrotrends in business. That’s its particular challenge. I wanted to ad some additional commentary on this point. My thinking on this is clearly work in progress, so feedback is welcome. Aaron, I think you understate Chicago’s history. As a “branch office” location in the “capital of the Midwest”, I believe it has a lot of Network Access features. For instance, a lot of intermediary functions that are place-specific have been located there for many years. Partly this is related to the trans-shipment nexus (river barge, ocean-going vessel, rail, truck), but partly it is just plain “location”. In this, I mean regional sales offices, regional distribution/warehouse facilities, etc. Admittedly, the world has changed in the two decades since I was last a buyer dealing worldwide. In those days, though, communication an information-management inefficiencies led many international sellers to have agency offices in Chicago for dealing with the Midwest manufacturers who were their customers. But to the extent that face-to-face sales and service are still done today, Chicago tends to be the place from which such functions are managed in the central US. A slightly different example: Navistar is playing Fort Wayne, IN against Lisle, IL (a Chicago suburb) for its tech/engineering functions. For this company, it would be a global hub, but such services are not particularly specialized; they could be done in any city. Clearly Navistar perceives some “global control” value of locating in a Chicago suburb, as well as advantages in talent attraction, and some disadvantages in attracting talent to Fort Wayne. cdc, if a service existed twenty years ago, it probably doesn’t have a “high dependency” on globalization as we know it today. At least not in the form it existed then. Clearly, as a regional capital, Chicago was always a regional supplier of various types of professional services you couldn’t get in smaller cities. You won’t get any argument from me there. That’s one reason I think Chicago should in fact care what happens in the greater Midwest. That’s its customer base. Agreed: agency and sales offices are far more dependent on customer base than on the location of the producer. But one is still likely to see Toshiba next door to Acme Screw (a hypothetical American importer/jobber) and down the street from the Emco (hypothetical US multinational equipment manufacturer) call-center/parts distribution facility. All of them would be selling parts or units made all over the world. To the extent that such offices exert sourcing, pricing, production planning and control decisions, they are more dependent on globalization and demonstrate Network Access characteristics. But if they’re just ordering a case of standard widget 1XB, breaking bulk, picking and packing, you’re right…they are not really Network Access. I think there’s some of both going on. One emerging Network Access category is freight logistics. 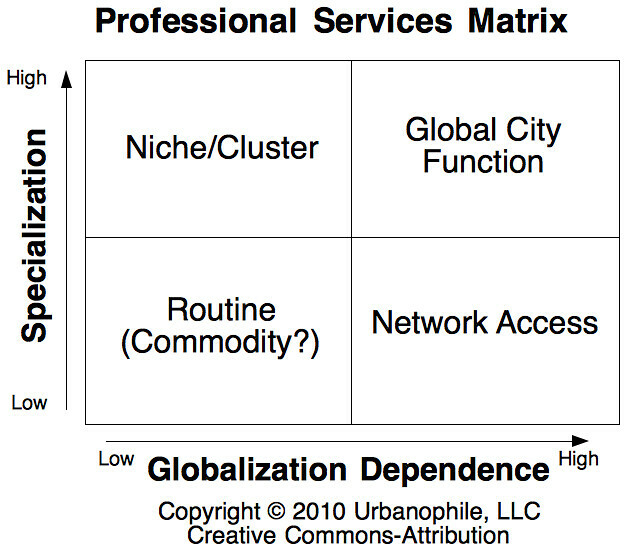 These are fairly standard career and service types throughout the industry, yet clusters are localized because “on-the-ground” knowledge is required. Each office has specialized nature of local regulatory requirements (example: the Clean Trucks Program at the L.A. and Long Beach ports), available real estate and business incentives, the presence or avoidance of organized labor, road and rail-based traffic options, and availability of warehouses and distributors. This sector becomes especially important in light of most manufacturing being completed overseas and shipped here. While offshore manufacturers have devoured American capabilities, the trade-off has been growth in the higher-value logistics services sector in port and depot cities. Wad, you’re 100% on. Theoretically, Chicagoland should be a Network Access total logistics hub, for air-freight as well as for barge, rail, and Great Lakes/ocean shipping. However, Indianapolis (FedEx), Louisville (UPS) and Memphis (FedEx) have usurped what should be Chicago’s “Midwest capital” place in air-freight logistics because O’Hare couldn’t handle the additional planes. The Indianapolis FedEx hub came into being because FedEx became landlocked at Memphis; it spawned a huge expansion in the logistics business in Indy, and Chicago is unlikely to ever win that business away. Chicago is more likely a location for rail-truck intermodal terminals, which also feed logistics-company growth. However, this rests upon the ability to convert underutilized railyard capacity (or rail-adjacent brownfields or exurban greenfields) to intermodal; I do not know if this kind of capacity actually exists in Chicago.